Life After Death. Reinventing Funeral Services Advertising. The subject of death and funerals in most of the world brings up somber visuals in monochromatic shades of black. Japan, is no exception to this with funeral services being viewed as a largely a black & white affair, with any deviation from the code being considered taboo and disrespectful to the deceased and the family. The March 11th Tōhoku earthquake and tsunami had a traumatic effect on Japan where so many people died as a result of this tragedy. Issues of life and death, hope and despair, beauty and tragedy became an all too real part of people’s everyday lives in Japan. 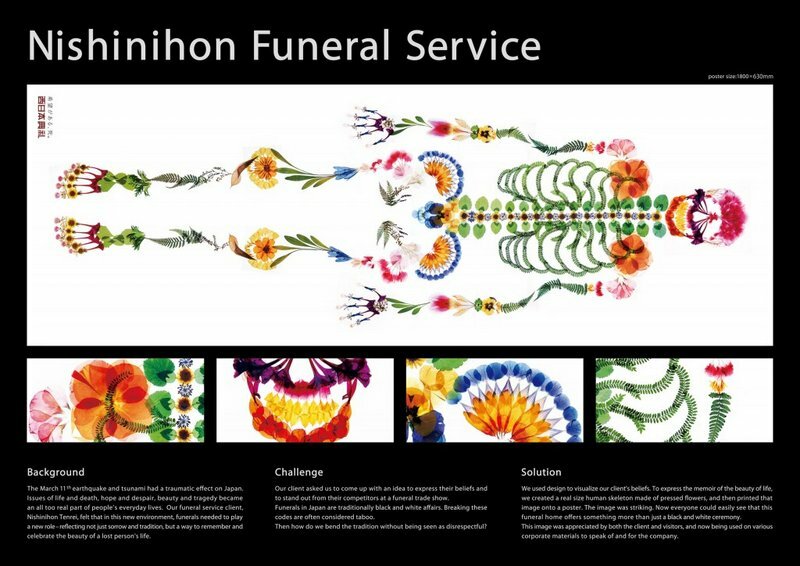 In the months that followed the tsunami, funeral home Nishinihon Tenrei approached Tokyo-based ad agency I&S BBDO and asked them to create an ad for funeral services that broke from the standard mode of operation. The request understandably posed several challenges for I&S. The challenge became how to communicate the funeral home’s new role of remembering and celebrating the beauty of a lost person’s life. The result is the spectacular image shown below. Creative director Mari Nishimura decided to create a real-size human skeleton made from pressed flowers. The image is both beautiful, as well as celebratory, expressing through flowers what remains after death. Posted in Advertising, Design and Art and tagged Advertising, Death, Funeral, Funeral Services, I&S BBDO, Japan, Mari Nishimura, Tsunami, Tōhoku Earthquake on May 15, 2013 by Author.